If you're feeling a little sticky at home, watch for these other symptoms of high humidity. Then, take steps to remedy the situation before it snowballs into a bigger problem. The solution? Finding the right dehumidifier for your home. Does your bread seem to go stale after a day or two? Do your crackers and cookies lose their crispness soon after you open the box? These aren’t just minor quirks that homeowners learn to live with, they are also signs that you may have a problem with high humidity in your home. 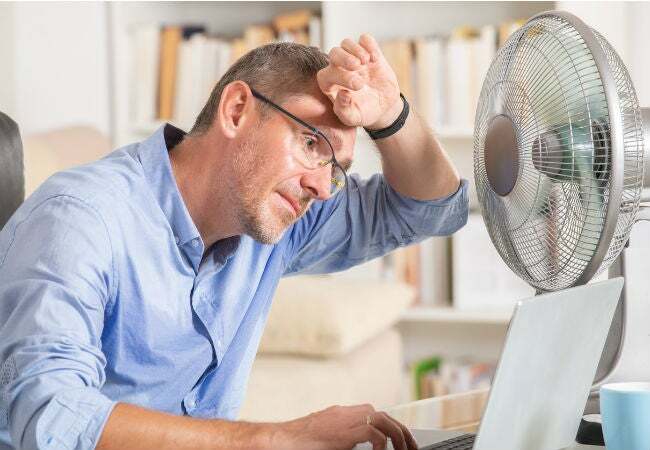 While these are fairly subtle symptoms, it’s worth paying attention because you could catch on to other issues created by high humidity that may negatively affect your house and your health. Look for the following five signs that your home has excessive indoor humidity, and learn what you should consider when selecting a proven moisture-removing solution: a dehumidifier. 1. You just can’t seem to get comfortable. “High humidity is just uncomfortable,” says Daniel O’Brian, a technical specialist with online plumbing and HVAC retailer SupplyHouse.com. It produces a “hot, sticky feeling you can’t shake.” When the temperatures rise, your body sweats to help you cool off. Then, as the perspiration dries, your skin feels cooler. In a home with high humidity, however, perspiration never quite dries, leaving household members damp, sticky, and downright uncomfortable. If this accurately describes the comfort level in your house, you’ll be pleasantly surprised at how much better you’ll feel in your own home when you’re running a dehumidifier. 2. Windows are wet—on the inside. “If you notice moisture on the outside of your window, it’s raining,” O’Brian says. 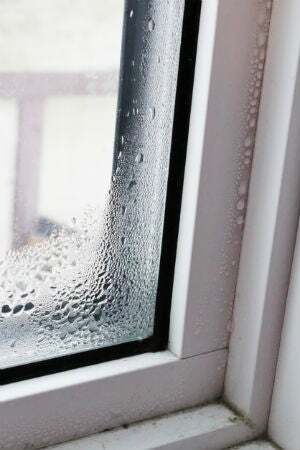 “But if you notice moisture building up on the inside of your windows, you might need a dehumidifier.” It’s most common for condensation to occur on interior windows during cold weather, when moist indoor air comes into contact with a cold glass window. If you’ve noticed that a number of windows throughout your house develop condensation, you could certainly benefit from a whole-house dehumidifier that connects to your existing ductwork to dry the air in every room, such as Honeywell’s TruDRY DR65 3000 Series Whole-House Dehumidifier. This Energy Star-rated dehumidifier can remove up to 65 pints of moisture from the air every day, and it comes with an integrated set-and-forget humidistat (think “thermostat for humidity”) that can also be controlled remotely. 3. Water stains have appeared on walls. Water stains on walls or ceilings that cannot be explained by a leaky roof or dripping pipes point to a humidity problem. Like condensation that builds up on windows, condensation on walls and ceilings is more likely to occur during the winter months, when exterior walls are colder than the temperature inside the home. When indoor air is humid, moisture will condense on those cold areas on the inside of exterior walls. You may notice dark stains over nail or screw heads, which are the coldest spots beneath the surface of the drywall. If the humidity is not reduced quickly, you’ll see much worse than a stain: The water that condenses could eventually lead to peeling paint or wallpaper, or even damaged drywall. The presence of mold clearly indicates that your home may be too humid, allowing airborne mold spores to latch on to damp surfaces and spread. Inhaling the airborne spores leads to health problems. In fact, symptoms like a stuffy nose, watery eyes, difficulty breathing (wheezing), and other respiratory problems may be early tip-offs to the presence of a mold colony. Once you recognize that you have a problem, have the mold removed promptly and then bring in a dehumidifier to address the cause and prevent the mold from recurring. 5. Your HVAC unit is too large for your home. Sure, it might have seemed like a good idea at the time to install a larger HVAC unit than necessary—you might have planned to have a home addition in place by now or assumed that a smaller model would perform worse. But the fact is that an oversize unit can lead to a number of problems, one being excess humidity in your home. SO, WHAT TYPE OF DEHUMIDIFIER IS RIGHT FOR YOU? 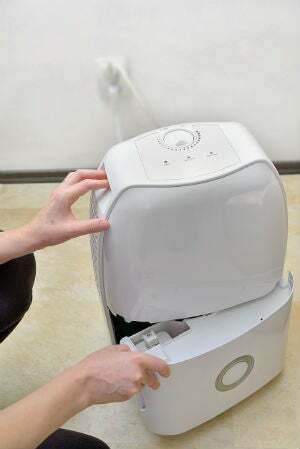 The two basic types of dehumidifiers, whole-house dehumidifiers and portable room dehumidifiers, both remove moisture from the air, but there are some important differences—and key pros and cons—you should familiarize yourself with before buying one for the house. As the name suggests, portable room dehumidifiers can be moved from room to room and plug into standard outlets to operate. They’re available in small, medium, and large capacities and are rated according to the amount of water they can remove from the air and the size of the space (measured in square feet) that they’re designed for. On average, room dehumidifiers can remove up to 45 pints of moisture per day. 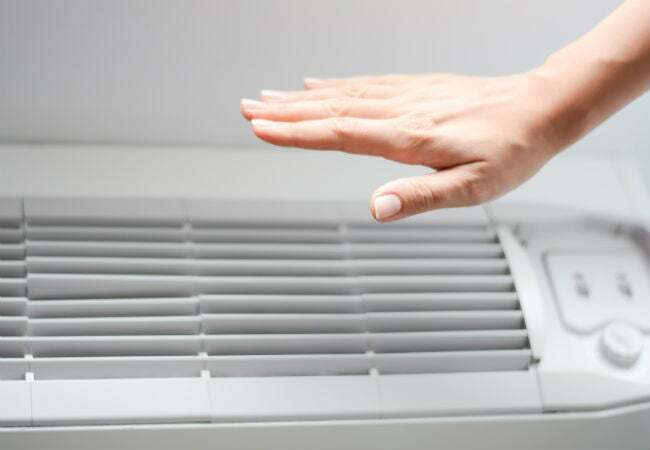 A whole-house dehumidifier, on the other hand, connects to your home’s existing ductwork to remove humidity all throughout the house. 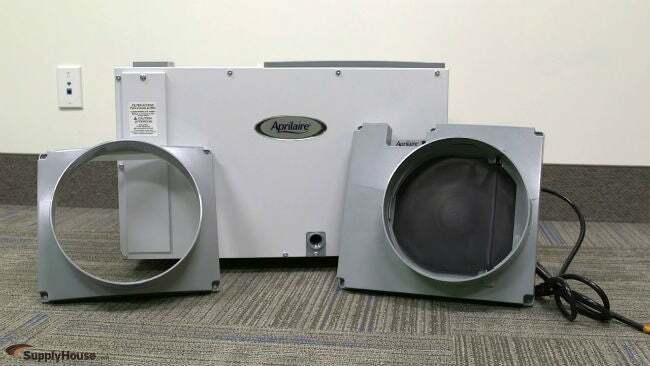 A model such as the Aprilaire Model 1830 (available from SupplyHouse.com) can remove up to 70 pints of moisture from your home’s air every day—that’s more than eight gallons of water! It effectively removes the stickiness factor from houses with up to 3,800 square feet of living space, and operation is easily controlled using an Aprilaire Dehumidifier Control (also available at SupplyHouse.com) that lets you maintain the level of humidity that makes you feel most comfortable in any season. In short, “whole-house dehumidifiers have the benefit of addressing the humidity evenly throughout the home,” O’Brian says. “Freestanding units can’t do that, but they may be better if only a room or section of a home has high humidity.” Start your search for a long-term solution by checking out SupplyHouse.com‘s selection of whole-house dehumidifiers, watching the retailer’s introductory video to these appliances, and consulting their quality customer service with any questions you may have along the way.